Are you a beach lover? Does soaking in the sun and feeling the warm sand in between your toes delight and relax you? 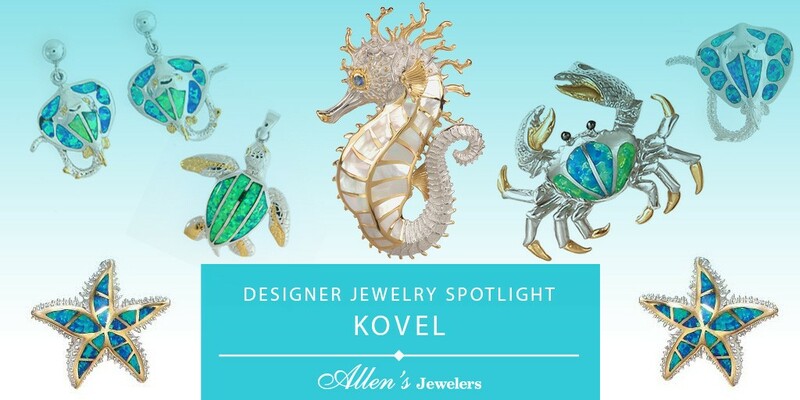 If so, you can enjoy the sights and sounds of the ocean all the time when you incorporate the Kovel Collection into your jewelry wardrobe. Kovel Collection is entirely designed and created by craftsman Dr. Kovel. He finds the inspiration for his unique collections from the ocean realm and the greater natural world. With each new design he strives to raise awareness to show just how beautiful and wondrous our world is. Kovel jewelry collections feature strikingly beautiful jewelry created using pearls, precious stones in silver, inlay, and a number of combinations to create unique showpieces. Every artist has their process from idea to finished piece. Understanding how the artist brings their inspiration into reality is not only fascinating, it gives each piece a special meaning and story. “First is an idea or inspiration. This may come from a request or seeing an animal or shell while I have been skin diving or walking a beach or from some photo out of a book or just out of the blue in a dream and usually it’s some form of combination of all of these is usually how it happens. The Kovel Collection features nautical and ocean inspired designs – perfect for celebrating a summer event such as a birthday, wedding, or special vacation with a gift that will spark treasured memories years to come.